Santiago de Compostela is one of the best known cities in northern Spain. Situated in Galicia, the city is a UNESCO World Heritage Site and the most important pilgrimage site for Catholics in Spain. Santiago, or St James in English, was one of Jesus’s disciples and travelled to Spain to preach the Christian belief. He returned to Jerusalem and was promptly beheaded by King Herod. His followers managed to return his body to Spain although the exact site of his burial was lost over time. According to legend, his tomb was found in the ninth century by a hermit who saw strange lights and heard noises in a wood near where it was thought that St James had been buried. The hermit reported these strange phenomena to the Bishop who set out to investigate. A body was found, accompanied by two others which were believed to be the bodies of the two people who had been sent with Santiago’s body to guard over it and who, when they in time died, had been buried next to him. 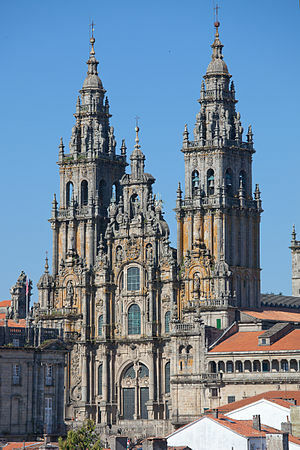 King Alfonso II ordered a church to be built on the site which has now evolved into the magnificent building which is the Basilica of Santiago de Compostela. What really set St James up as patron saint of Spain was the legend of the Battle of Clavijo between the Spanish and the Moors, who had invaded most of Spain in the eighth century. Only the most northern provinces had not been subdued.Legend has it that the Spanish troops were being forced back by the soldiers of Abd ar Rahman II when a knight on a white horse appeared miraculously to encourage them and lead them on to victory. The knight was said to be Santiago who from then on was given the appellation of ‘Matamoros’ or ‘Moorslayer’. Interestingly, historians in recent times have dismissed the idea of the Battle of Clavijo. Reference to it is only found in documents dating from much later, in the twelfth century. Whatever the truth, Santiago became the patron saint of Spain and many people have travelled the ‘Camino de Santiago’, a pilgrimage road that leads from France though northern Spain to the great cathedral of Santiago de Compostela where the saint’s body lies in a magnificent tomb. The people who travel the road number in the hundreds every year and are not necessarily religious. Santiago is a big feature of many festivals in Galicia especially at Easter but he has his own special day on July 25. This is by far the biggest and most important of the feast days. Firstly, the day is a public holiday in Galicia and Pais Vasco (Basque Country) so that everyone can enjoy the fun. Special church services are held in the magnificent cathedral with a very large incense burner (Botafumeiro) swinging across the altar pouring out scented smoke that fill the building. There are also art exhibitions, plays and street events such as folk dancing. Music is very much part of Galician tradition with bagpipes an important instrument. A huge concert is held on the night of the fiesta featuring big names in the pop world, with the obligatory fireworks display as the finale. Santiago even has his own cake,the origins of which are believed to date back to medieval times, made with almonds and featuring a cross of the Order of Santiago on the top. Known as ‘tarta de Santiago‘, the cake is eaten all year round but is particularly popular on his feast day. 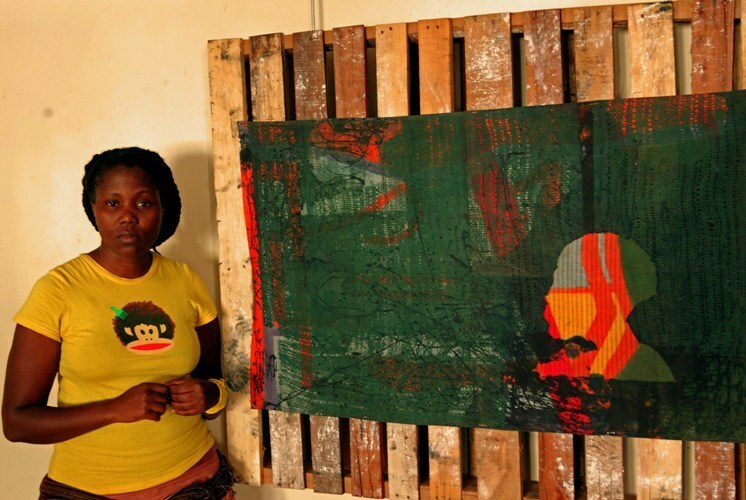 Artists from Zimbabwe will be taking part in the 2013 Venice Biennale, the 55th International Art Exhibition to take place in the Italian city. The exhibition runs from June 1 to November 24 2013. The Zimbabwean artists whose work will be on display are Portia Zvavahera, Michele Mathison, Rashid Jogee, Voti Thebe, Virginia Chihota. The exhibition is curated by Raphael Chikukwa. Mrs Doreen Sibanda, the Director of the Zimbabwe National Art Gallery has been ‘the driving force behind this initiative’. The title of the exhibition is ‘Dudziro’ and according to the National Gallery website, it will be about ‘re-examining the visions of religious beliefs in relation to the current global politics that question the status quo of the role of religion in society’. See here for more information about some of the artists. At 88-years-old, Robert Mugabe has been President of Zimbabwe since 1980. He has presided over the decline of his country, the death of millions of people and is determined to carry on as President for as long as he possibly can. Robert Gabriel Mugabe was born on Feb 21,1924. His father was a carpenter and his mother a teacher. His father went to South Africa when Mugabe was young, supposedly to work at a Jesuit Mission, but he never came home, leaving his mother to bring up her four children on her own. Robert Mugabe received a good education, attending a local Jesuit Mission, then studying privately whilst teaching. He went to the University of Fort Hare in South Africa where he received a BA in History and English in 1951. He did a correspondence course to gain a Bachelor of Education degree in 1953 and a Bachelor of Science in Economics which he did through the University of London and then completed in 1958 after moving to Ghana. He met and married his first wife, Sarah Heyfron whilst still in Ghana. Mugabe had declared himself to be a Marxist whilst still in Ghana but it wasn’t until he returned to his home town in what was then Southern Rhodesia to introduce his wife to his family that he became involved in politics. He felt strongly that the black residents were being denied basic civil rights and joined the National Democratic Party. The party was banned in 1961 and then reformed to become the Zimbabwe African Peoples Union (ZAPU). The leader of the party was Joshua Nkomo, who would later become a target of Mugabe’s hatred. Mugabe felt that the talks being held between ZAPU and the United Nations, demanding a change in the constitution of the country was not going far enough. He called for a guerilla war. In 1963, he and other former supporters of Nkomo founded their own resistance movement in Tanzania, calling it the Zimbabwe African National Union (ZANU). When he returned to his home country he was promptly arrested and sent to prison, where he would remain for ten years. In November 1964, the Prime Minister, Ian Smith, called for a Unilateral Declaration of Independence from British rule and the country of Rhodesia was born.Whilst in prison, Mugabe continued to educate himself and his fellow prisoners. He was freed in 1974 and went into exile in Zambia and Mozambique. A bloody war broke out between the people and government of Rhodesia and the guerilla movements, ZANLA loyal to Mugabe and ZIPRA loyal to Joshua Nkomo. 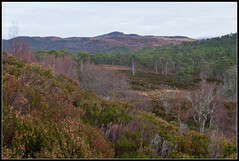 The two groups were divided on tribal lines. Whilst the war was seen by many as strictly white against black, this was not in fact true. Many of the black population of Rhodesia fought valiantly to protect their homeland. By 1978-1979, the majority of regiments in the Rhodesian army were composed of all black troops, with the Rhodesian African Rifles perhaps the most famous. Many civilians were killed during the bitter battles that raged across the country. In 1978 an agreement was reached between the government of Ian Smith and moderate black leaders in Rhodesia. Bishop Abel Muzorewa became the Prime Minister of what then became known as Zimbabwe-Rhodesia. However, neither ZANU or ZAPU had taken part in the agreement and the British government then intervened, brokering the Lancaster House Agreement. Elections were held in 1980 and Robert Mugabe swept to power. At first, he worked hard to convince the white population, especially the farmers whose hard work had made Rhodesia the bread basket of Africa, to stay. However, he still had his arch enemy to deal with. In 1982, Mugabe sent his Fifth Brigade, elite soldiers trained by the North Koreans, into Nkomo’s stronghold in Matabeleland, the southern province of Zimbabwe. Many thousands of people were killed in what many people see as a form of political genocide. At first, Mugabe’s election was seen as a good choice by all sides,with restructuring the economy, building schools and clinics and encouraging manufacturing all part of his original five year plan, but as time passed, he became more tyrannical , proving the old saw about “absolute power corrupting absolutely”. Anyone who didn’t agree with him was likely to suffer unfortunate accidents, including those who had been at his side throughout the guerilla war. His wife died, leaving him free to marry his much younger mistress, Grace Marufu. 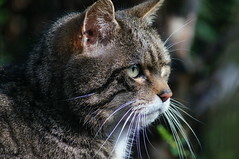 By 1996, his unpopular decisions began to cause real hardship to his people. His decision to seize the land of white farmers, paying no compensation and killing those that refused to move, meant that the food chain spiralled into chaos. Unemployment shot up as did inflation. He managed to get himself re-elected by using scare tactics and in some cases outright force. From being the bread basket of Africa, Zimbabwe now turned to the international community for assistance. Mugabe’s decisions led to the economy going into meltdown with the Zimbabwe dollar going into a rate of hyperinflation almost unprecedented. Spending on healthcare, education and housing came to a virtual standstill which meant that the AIDS virus was able to take a death grip on the population with 1,2 million of the population suffering HIV or AIDS in 2011 according to a report by UNAIDS, a further 1,6 million people are predicted to be unable to find sufficient food in the first three months of 2013 and regular cholera outbreaks are further decimating an already suffering population. The sick and starving people are forced to read about Grace Mugabe’s frequent shopping trips to Europe with the British Sun newspaper claiming that she has spent over 1,2 million pounds feeding her shopping habit. In 2008, Mugabe was forced to accept a power sharing deal with the opposition Movement for Democratic Change (MDC), led by Morgan Tsvangirai, following negotiations brokered by South Africa. This has in no way decreased the violence that is a way of life for Zimbawean citizens. 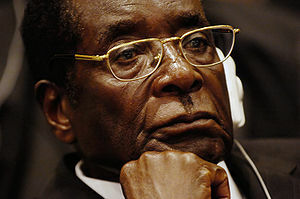 2013 will see a new round of elections that the 88 year old Robert Mugabe is confident he will win. There have been rumours of health problems, including prostate cancer, that he has shrugged off as being “colonialist propoganda”. Human Rights Watch said in a report released on Jan 10 2013 says that “Zimbabwe’s “unity government” is failing to carry out reforms in the country’s Global Political Agreement that are vital for the country to hold credible, free, and fair elections in 2013”. Many Zimbabweans fear that, if there are elections, there will be the same violence that has characterised all the previous elections and that nothing will change. As long as Robert Mugabe remains in power, their fears are justified.